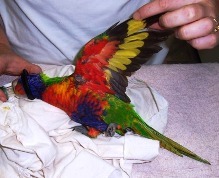 Birds are carefully caught and masked down. 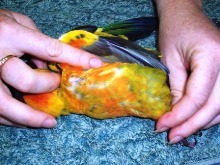 Note the spectacular colours of this sun conure. The arthroscope is passed into the abdomen to view the single ovary in females or the double testies in male birds. Right side down, wings upward with the left leg extended.